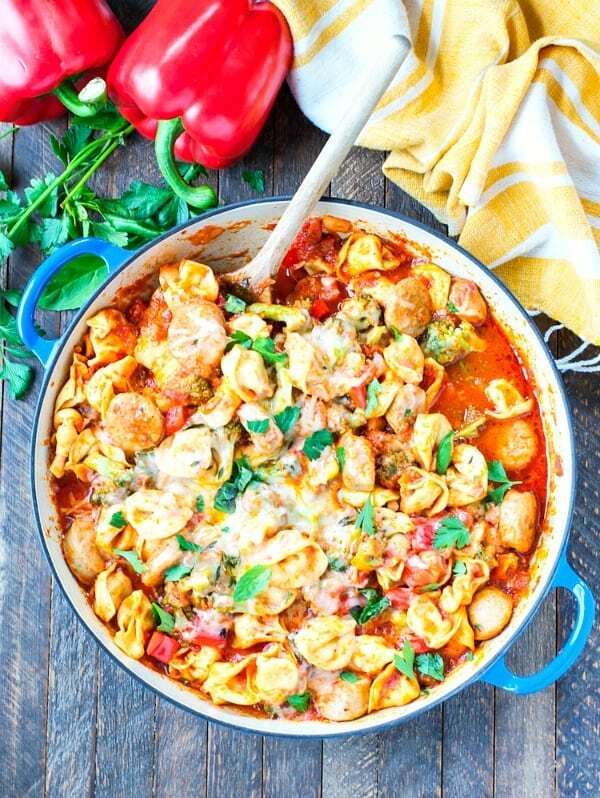 A rich and flavorful one skillet chicken sausage tortellini that's so easy to whip up and requires minimal clean up afterwards! 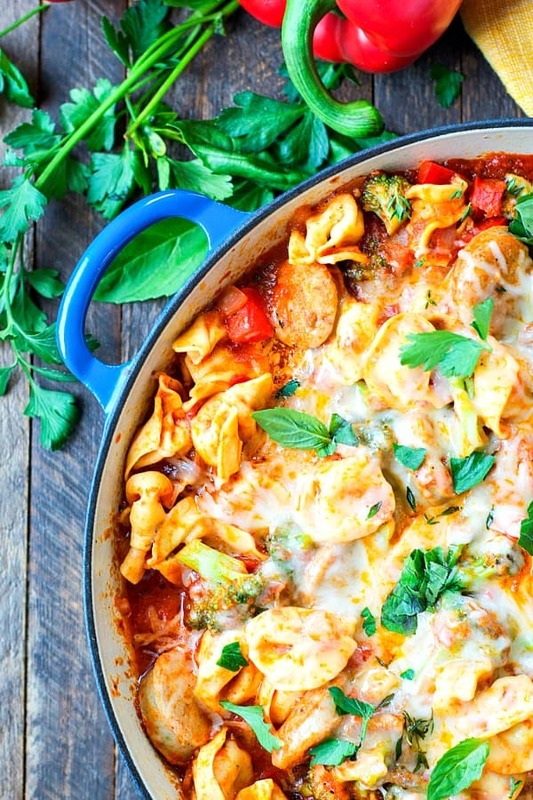 One skillet meals like this Chicken Sausage and Tortellini make easy dinners a breeze — with very little clean up at the end! The pasta, the sausage, and the veggies all cook together in a rich Italian sauce for a simple supper that’s ready in less than 30 minutes! Whether you have kids or not, dinner just seems like a tough meal for most of us to pull together. We’re tired at the end of the day, rushed if we get home late, and just generally starving and cranky! Add a fussy baby, roughhousing school-age boys, or an over-tired toddler to the mix and it’s no wonder that carry-out pizza or mac and cheese starts to look good. 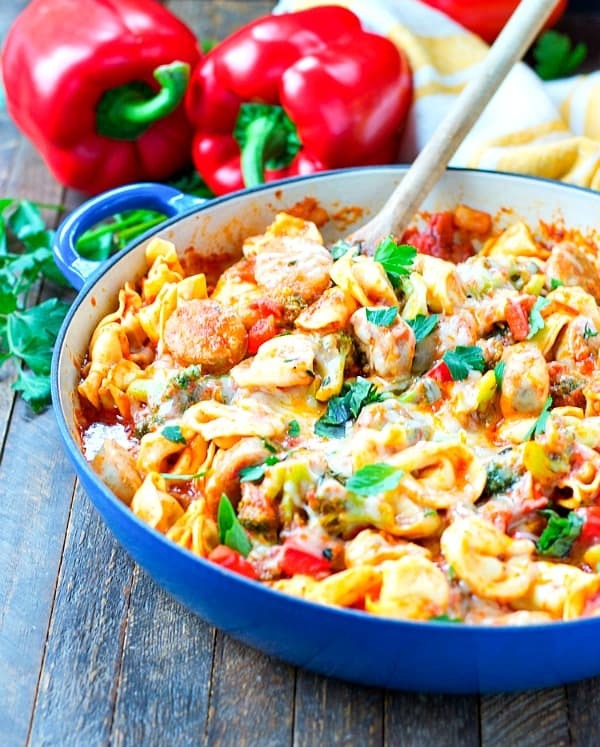 What if I told you that this one skillet tortellini recipe will come to your rescue — even when you think the dinnertime cards are stacked against you?! I’ve tested it myself under the most stressful circumstances, and I can honestly say that it’s a WINNER. One skillet. Less than 30 minutes. Plenty of veggies to assuage any pasta guilt. Aaaaaaand…your roughhousing school-age boys will actually eat it! Made with easy to find ingredients this dish is so comforting and easy to whip up. You can also freeze this minus the mozzarella topping! 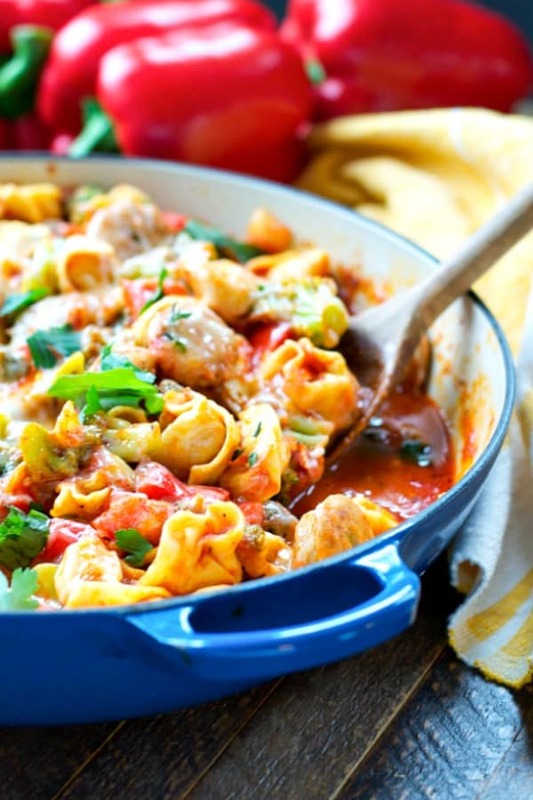 No matter what chaotic mess is going on your house at the end of the day, I can guarantee that this Chicken Sausage Tortellini will be on the table in less than 30 minutes. Best of all, you’ll only have one skillet to wash…giving you more time to mop up the floor when your self-taught potty-training-child has left his mark!? Heat olive oil and garlic in a large skillet over medium-high heat (about 1-2 minutes). Stir in sausage rounds and cook until browned (about 5 minutes). Add pepper, onion, broccoli, tortellini, marinara sauce, and broth (or water). Bring to a boil. Once the mixture boils, turn the heat to LOW, cover, and simmer for about 7-9 minutes (or until tortellini is tender). Remove from heat. Remove lid, sprinkle mozzarella over the tortellini, and place the lid back on top until the cheese melts (about 1 minute). Garnish with Parmesan and fresh herbs, if desired. Cooking just for Two? Cut the ingredients in half! The rest of the instructions remain the same. 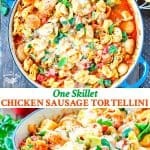 I love using tortellini in skillet meals! I just made a dish using Italian sausage the other week, so I’ve got to try this chicken sausage version. Love the pretty colors too, Blair! Looks delish! No more potty training horror stories!! LOL. We keep trying to get ours to take interest, but NOT INTERESTED. I cannot wait to stop buying diapers for both kids. UGH. 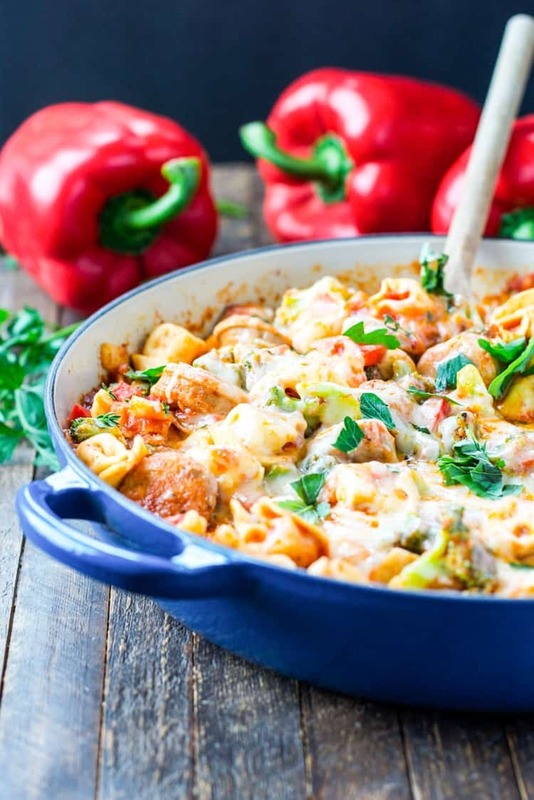 Busy moms love one pot meals. Once again you nailed it and the photos are stunning! 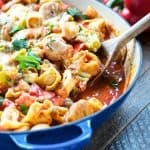 I absolutely LOVE one skillet dinners, even though my potty training days are 20 years behind me! I promise it will happen one day…and in the meantime, yay you for this scrumptious recipe! Hah! Thank you so much, Kate! I’m sure that I will still love one skillet meals in 20 years as well! 🙂 Have a great week! Yummy! This makes a delicious lunch idea, Blair! Thanks, Agness! I agree — it’s great for lunch or dinner! Just found your site and have to say thank you so much for including nutritional info! Having recently been diagnosed as Type 2 Diabetic, that’s quickly becoming the first thing I look for whenever I find a delicious looking recipe. And I’ve bookmarked several of your recipes to try in the very near future because I know they fit within my dietary limits. Looking foward to checking out more recipes! Hi, Sue! I’m so glad that you find the nutrition information helpful and that you will try some new recipes from the blog. Enjoy, and thanks again for reading along with us! What a wonderful recipe! And so easy. One pot meals are so convenient. And I love the blue skillet. Thanks so much, Danielle! I agree — one pot meals are the way to go! I saw this recipe on Pinterest and it’s one of the best I’ve ever tried. It’s very easy to make and so flavorful. My husband really liked it and suggested that I make it the next time we have company. By the way, this is the first time I’ve ever left a comment about a recipe. It was that good! Hi, Amy! I totally understand what you mean when you say that the slow cooker is helpful as a busy mom! I use my Crock Pot at least once a week for that same reason! Hi, Kathy! The strong sausage taste is going to come from the sausage that you cook in the skillet. The oil that the sausage releases in the pan, as well as the sausage itself, is going to flavor the rest of the ingredients in the dish since everything cooks together. I don’t think you did anything “wrong” in that regard. Maybe you just don’t care for the taste of the particular sausage that you used? You might try a different brand or flavor next time? I made this recipe tonight for my 2 year old daughter and I. It was definitely a hit ! I will for sure be making this in the future.